Smart home systems have grown considerably in popularity over the past couple of years, and you only have to look at Google’s acquisition of Nest to see that this emerging market is to be taken very seriously indeed. Apple is also flexing its muscles in this regard by embedding the HomeKit system into its iOS platform, and with CES upon us, one company has come up with a new system that integrates with Siri and HomeKit to offer seamless, voice-activated unlocking solutions. We’ve all salivated over that beach mansion which, for the most part, is controlled by Apple’s iPad. But while the dreamy setting and grandiose nature of the property is certainly impressive, smart home systems are actually within the grasp of most people. Schlage is a company looking to make this point abundantly clear to the modern consumer market. The outfit is a division of Allegion, a company focused on tech-based security, and looking at the all-new Schlage Sense, innovation is clearly one of its specialties. Despite the swathes of tech we now have at our disposal, the vast majority of us still use traditional cut keys to enter our houses, gates and generally locked areas, but with such intelligent hardware at our fingertips, it’s a crying shame that this remains the case. 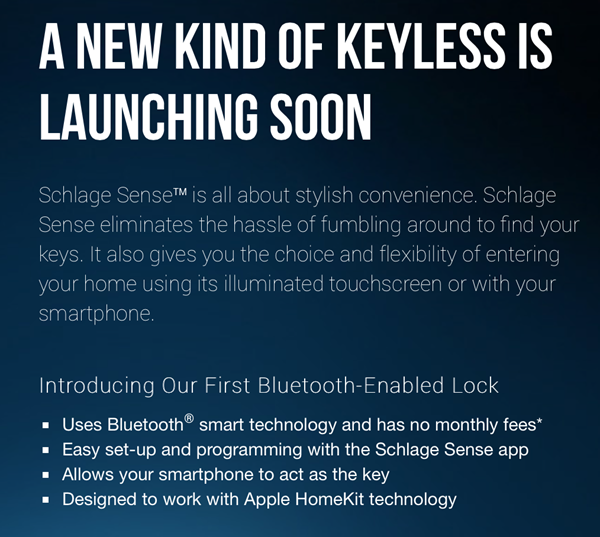 The Schlage Sense will unlock a door at your command thanks to its integration with Siri and HomeKit, and it also packs a keypad for code-based unlocking as an alternative. 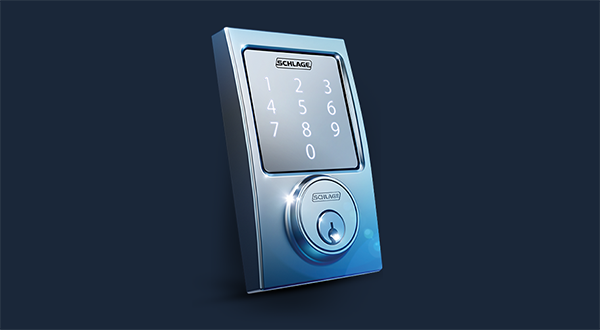 It’s fully secure and encrypted, so there are no real concerns on that front, and if you’re looking to delve into the realm of the smart home systems but unsure of where to start, the Schlage looks a fairly good introduction. It can be programmed to manage up to 30 codes at any one time, so while it’s simple in how it operates, the infrastructure is rather sophisticated. It arrives complete with its own tailor-made app, and offers alarm alerts should any suspicious or otherwise untoward activity occur. It’ll hit U.S. retail outlets later on this year, and should any details emerge on pricing or a specific release date arrive, we’ll let you guys know right away, so stay tuned!